Martha and I are happy once again to reach into our china cabinets and share with you! Today's post is about Romance. Since Valentine's Day is just around the corner, I want to share with you things of a romantic nature. The first cup I would like to share with you is a cup that speaks romance! I found this cup at ABC carpet and home near Union Square in NYC a couple of years ago. It has the most gorgeous colors, as well as an exquisite raised gold design and beautiful pink roses. It appears to be hand painted. A company called Meander BV created it. The roses really are gorgeous in person. 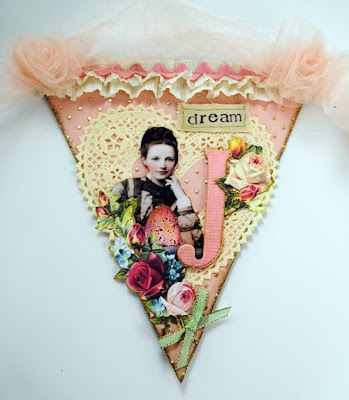 This pink pennant is part of a Spring Joy Banner I created recently. I wanted to make a romantic Banner that speaks of joy. This is the first in three pennants, the others being the O and the Y. I have just posted a video tutorial for it on YouTube. I will share a secret...I made a rather funny boo boo during the taping but left it in because it was too funny, if you watch it, let me know if you notice what I said incorrectly! The girl image is from Paperwhimsy. 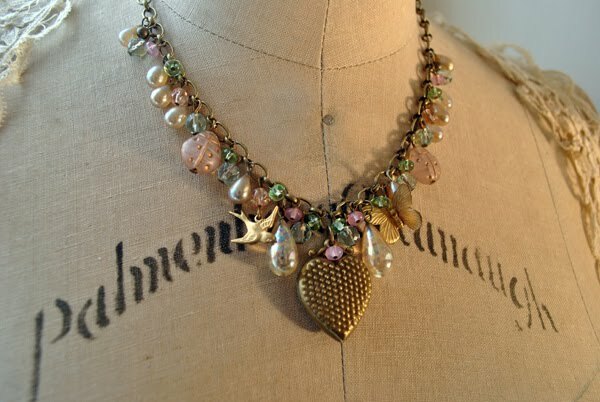 How about a pink romantic heart necklace? Or a red romantic heart necklace? My second cup is a little sweetie. She is so cute and she too is a very romantic cup with the lovely gold filigree and the pastel colored pansies. The little handle has a dramatic angle to it. When I bought it I had not checked to make sure the cup and saucer were of the same make. I just assumed they were. This cup taught me to always check both before buying. Truthfully though, I would have brought it home anyways! It was only $4!...and it is really lovely. and speak to me in that voice? Now nothing can ever be the same again." This is how I felt when I met my dear sweet man 23 years ago, and nothing has been the same since.....only it has been much better! Thank you so much for stopping by my blog and sharing today with me. It has been a pleasure! I love reading your comments! 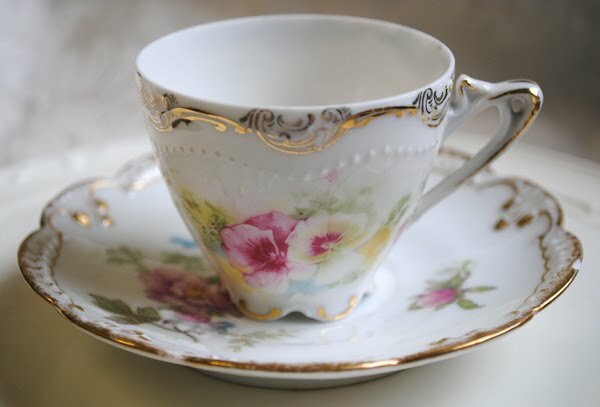 If you would like to play along, post about one of your tea cups, who made it, it's history, why you love it, how you came to have it.... things like that. Then link up below with Mr. Linky by filling in the two blank. Remember to click on your own link once it is made to make sure it goes to your blog. We don't want to miss visiting you and seeing your tea cup! Hi Terri - I sure do love your romantic teacups, love the roses and the color, but most especially love the heart necklaces. Hope you have a wonderful Valentine holiday! Terri...thank you again for this beautiful tea cup and saucer! I absolutely adore this set & hope you enjoy reading my post! Thanks for hosting this tea cup party...hugs! What a beautiful post Terri! I love your tea cups. The first one is amazing! The colors and design are exquisite! 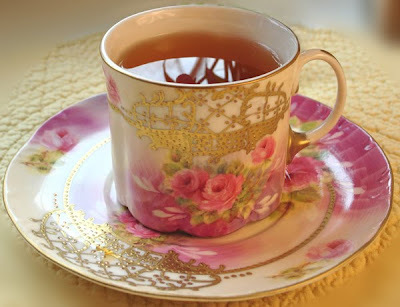 The second tea cup is so pretty and sweet, I would have bought it too! I goofed & signed up on Mr Linky on both your sites...duh!! Love your post...as usual! Thanks again, again! Both of the teacups are so pretty! as are the gorgeous necklaces. love your banner. you ahve been a busy lady! Exquisite beyond Terri!.., What pretty, pretty teacups and lovelies! Have a marvelous week and Valentines day! Beautiful teacups! Meander can be bought over here in giftshops, I'm not sure whether it is Dutch or French. 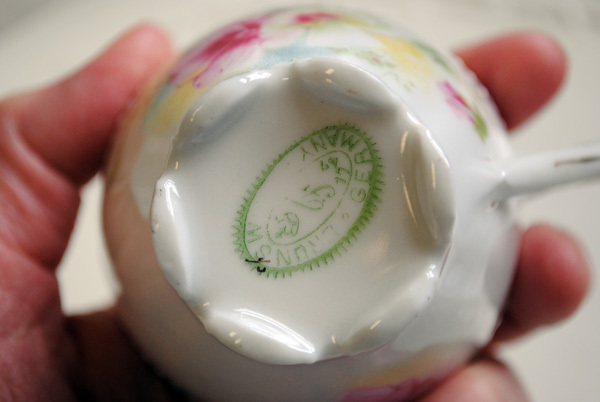 I saw a teaservice like this on our 'Craigs list' (=Marktplaats = market place = online auction) the other day. Check Markplaats.nl for other Meander motives, I love it! Have a lovely day! Dear Terri, you made me swooned, gasped, awed with your teacups today! I love love love both of your teacups! they are absolutely gorgeous! wish I could find one like yours or both like yours! am so speechless! I keep coming back salivating! huhuhu! you're so crafty! I love the pennants you made and will definitely watch the tutorial after leaving this comment, I agree wholeheartedly that your teacup speaks romance, the golds are lovely and I especially love the detail and the pink color, Thanks for sharing and happy teacup tuesday! The tea cups are small little beautyes- wonderfull collection. Terri, this was my first visit to your UTUPE , so many gorgeus things to look at- now I know what to do tonight- thank you. 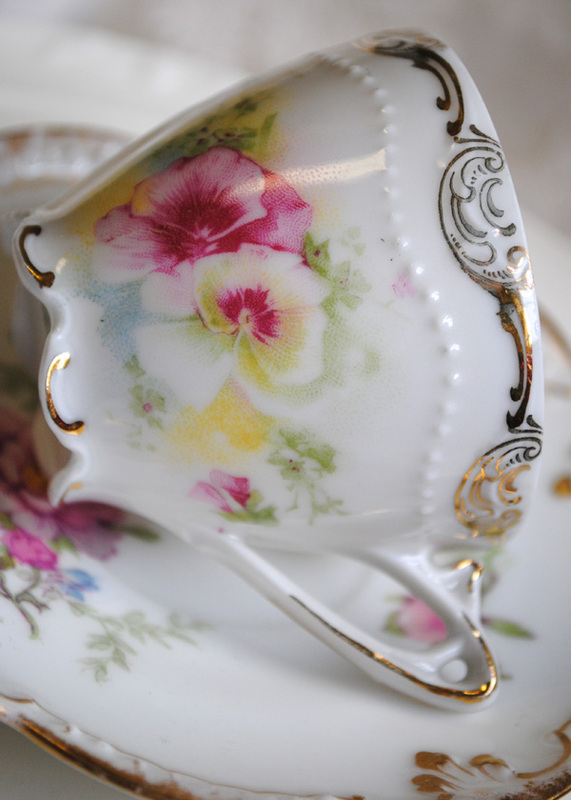 Your teacups are so very pretty but I do love the first one! Love pink roses! Thanks for sharing with us. The teacups are beautiful. I especially like the romantic hand painted cup. Your jewelry is wonderful - so feminine and the penant is very pretty. Thanks for the link to the tutorial. Good Morning Terry-enjoyed your post today. Lovely teacups,banner and necklaces.I'm in a teacup tues. also but I think it's a differant one. Wow...Terri..I am in love with the beautiful cups today..oh my..they are dazzling and so pretty and summery! Super WOW..your fabulous creations...they are just too dazzling...love the necklace..very inspirational! Shine on..you are magnificently creative! yay happy tea..and i am so happy for you and your love! Sounds like a wonderful man! Terri, that those are gorgeous cups!! The raised gold is beautiful on the first, and the colors are exquisitely applied. I love the pink/lavender wash behind the spray of roses - very dramatic! The dainty second cup is perfectly delightful and I was very attractive to me. I think it's the shape and daintiness of it. I also am delighted with the raised white dots around the rim. 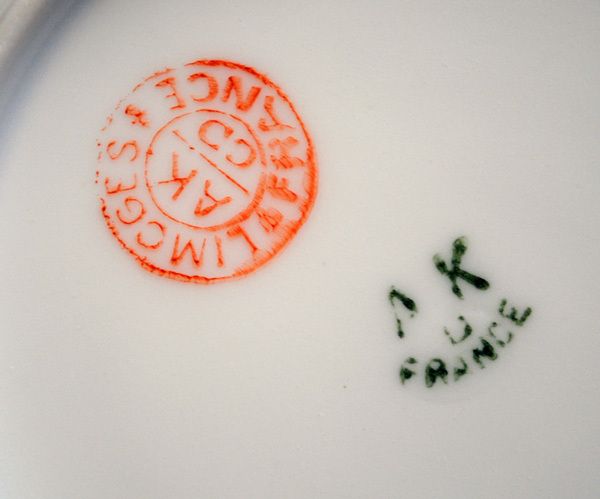 And how wonderful that the cup and saucer are not from the same maker, yet are divinely matched! Your banner project is wonderful. You are so creative and it's so much fun to see all the things you come up with. I can't wait to see it completed. I'll try to take a look at the video and see if I can notice your "blunder". The necklaces are happy pieces - that is they would coax a smile from anyone. Thank you for sharing today, and for giving us the chance to share, also. I don't know which I like more, the teacups or the necklaces. Everything is so beautiful. I enjoyed your post! P.S. Terri, that quote is one of the most romantic things I've ever read. As usual I love both your cups - I think the first is my favorite . Can't wait to see your finished banner. Hi Terri, Your first tea cup is just exquisite! Stunning! Gorgeous! Love the necklaces too. I enjoyed your post today. Happy Valentine's Day! The Meander BV teacup is exceptional! Thanks for hosting. Hello! @ beautiful tea cups . The first one particularly spoke to me! The necklaces are stunning and the banner is delightful!! I also love the heart boxes in the previous post!! You know I love everything you post and today's items are no exception but I must say, that first tea cup and saucer are exquisite! What a find! Do you display all of these? 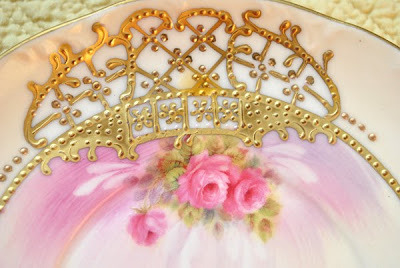 Terri, what a beautiful cup with roses and the gorgeous gold decoration - just luscious! I love your necklace as well. As someone has already said, what a busy bee you have been this week. I LOVE your tutorials, Terri! Your banner is beautiful, and yes, I noticed the "Paper Imsy Girl Whimage"--so cute! We all do that sometimes! By the way, where did you get your chipboard letters? Oh, I forgot the necklaces--so very pretty! So much "eye candy" here! Ohhhhhhhh I am in weepy tear state reading the romantic verse and how you feel about your lovie. then and now. Dear friend.......this touched my heart so. And the banner you are making...sigh..gorgeous and makes me happy just to look at it. I cannot wait to watch you newest video. and may joy rain down upon you this day. please check the link on Sandi's Chintz Cottage, it took me to your post from Dec. 20. Your todays post is so charming. I love this two cups, they are just wonderful. I had never had the idea that cup and saucer are not from the same maker. They match perfect. Thank you for your wonderful Tea Time. 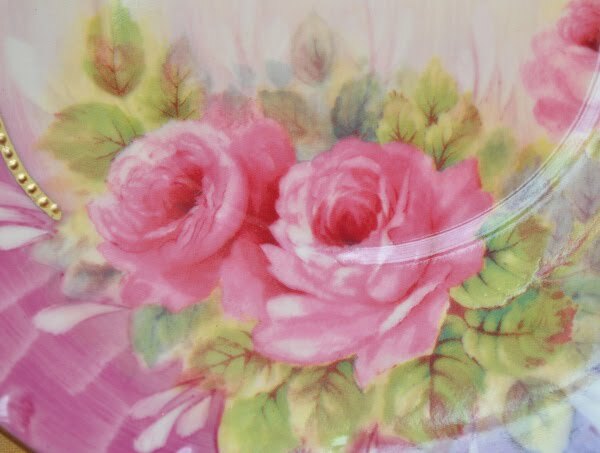 The first teacup & saucer are so vibrant with lush spring colors, just beautiful! Romance, a topic that is sweet to think about when we are happily married to our Sweet Hearts. I am looking forward to viewing your tutorial. Thank-you Terri for hosting Tea Cup Tuesday. what a stunning and delicious visual display of delightful things you have shared with us today! the first photo is amazing that cup is making me so jealous ( in a good way )... I want one too! so glad I popped in here! I am addicted to looking at pretty things! I especially like the tea cup you posted with the pansies! So beautiful. The saucer looks like it might be a good match anyways! Such gorgeous tea cups! So elegant. Thanks for hosting such a wonderful tea party. Hi Terry thank you very much for visiting my Blog, as soon as I can I will participate again, as I´m I love everything related to tea, with a special care for antique tea sets. 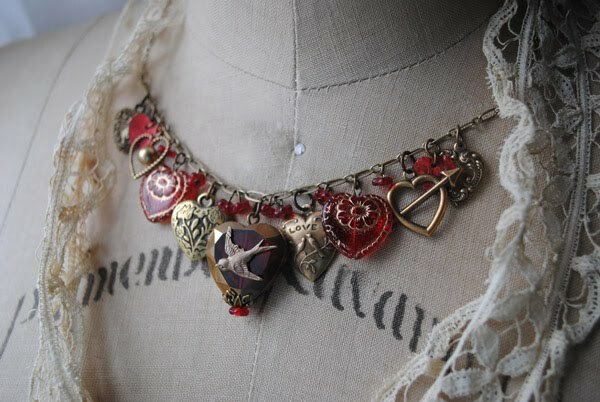 The necklaces are lovely and your teacups are gorgeous.